British Culture Secretary Jeremy Hunt leaves his office in London yesterday as the pressure mounted. THE BRITISH CULTURE Secretary Jeremy Hunt is under pressure today after documents disclosed at the Leveson inquiry into UK media ethics suggested that he secretly backed Rupert Murdoch’s multi-million pound takeover of BSkyB. News Corporation executive James Murdoch’s lengthy testimony at the inquiry yesterday revisited his controversial role in the one of the biggest political and media scandals in recent British history . But far more explosive and potentially damaging to the government of Prime Minister David Cameron were revelations about how a senior British minister allegedly went out of his way to smooth the path for one of his biggest-ever business deals – the News Corp attempt to take full control of British Sky Broadcasting (BSkyB). 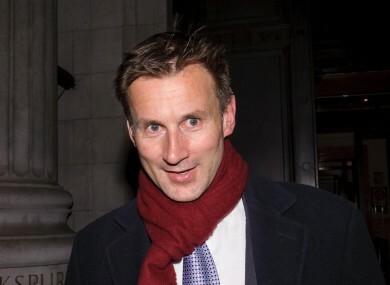 As the minister charged with deciding whether to refer the takeover deal to Britain’s competition authority, Hunt was meant to have been neutral but a cache of text messages and email appeared to undermine this though the Tory minister has denied any wrongdoing. “He said we would get there at the end, and he shared our objectives,” was how an email from News Corp lobbyist Frederic Michel described Hunt’s attitude. Other emails appeared to capture Hunt’s office providing Murdoch with sensitive intelligence on his political opponents and offering advice on how best to present his bid. In that statement to lawmakers, Hunt said: “I am approaching the decision with total impartiality and following strict due process.” He had been appointed to the process after Business Secretary Vince Cable was forced to recuse himself following revelations that he had, in his words, “declared war” on Rupert Murdoch and his bid. But Prime Minister David Cameron expressed his full confidence in the minister tasked with overseeing the London Olympics later this year but the nature of the Murdoch family’s links with senior politicians was laid bare yesterday. Murdoch’s testimony gave a feel for his company’s considerable clout with senior politicians with around 20 lunches, breakfasts and other meetings with Cameron and other leaders — including former prime ministers Gordon Brown and Tony Blair – disclosed. Cameron’s own relationship with the Murdochs has come under scrutiny after it emerged that he is a friend of the former News International chief executive Rebekah Brooks, whose horse he rode. Brooks was forced to resign from the News Corp subsidiary last year after it emerged that the now-defunct News of The World newspaper hacked the voicemail of murdered schoolgirl Milly Dowler, a revelation that blew open the phone hacking scandal in the UK. During his testimony to Leveson, Murdoch was forced to defend his record at the head of his father’s scandal-plagued British newspaper arm. He repeated the allegations that the tabloid’s then-editor Colin Myler and the company’s former in-house lawyer, Tom Crone, misled him about the scale of illegal behaviour at the newspaper. James Murdoch’s father, Rupert, takes the stand today to give evidence which could last as long as two days and may be even more revelatory. Email “Murdoch testimony puts pressure on British government minister ”. Feedback on “Murdoch testimony puts pressure on British government minister ”.